There are many things you can do on your PC and earn a little extra cash. There are many software programmes you can use to create perfectly good professional looking work, some of which are free ! Microsoft Publisher has a few good wizards. The only overheads are the time spent and the paper / cardboard. Speed of service is the key. With a lot of 'instant' business card machines going up in Shopping precincts, you are in competition, but this is outweighed by the fact you can make them even more personal and offer more colour and graphics. If you're just doing the odd job as a bit extra then there's no need for expense in so far as marketing and advertising. Just a card in a shop window or a card on the notice board of your local Pub will do. After all, the thought of sitting at a PC 12 hours a day to earn a living isn't exactly fulfilling your downshift dream. If you have a camcorder, the chances are you just keep your film on tape and go through the palava of plugging into the TV every time you want to watch it. Also, the film may have the jerky bits you could do without etc. 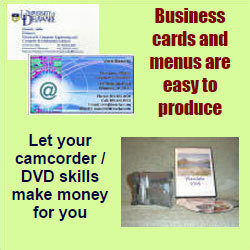 If you have a DVD Re-Writer and a reasonable video editing programme such as Pinnacle Studio or uLead Video Studio, you plug your camcorder into the PC, edit the film, add commentary, background music and special effects. Make one of your own and show it to a few friends, the chances are they haven't the equipment or the time to do such a venture and will ask you to produce a DVD for them. Once you have the hang of these programmes and learn things like not to have a shot for more than 6 seconds or so, you're on the way to being a competent 'film producer'. The editing itself doesn't take long, but the transfer to a readable format takes a while for your PC to do (an average DVD of about one hour will take about 90 minutes to 'burn' and it will use a lot of PC resources, so bare in mind you won't be using the PC whilst this is being done. With the advancement of camcorders, there are a lot of the old Standard *'s around waiting to be copied and remember the VHS recorder won't be around for much longer. Are we 'wasting our talents' ? If we have some and are good enough at them - why not get something back from it !